The Oregon Shakespeare Festival was born on July 2, 1935, with a production of Twelfth Night. Reserved seats were $1.00, with general admission at 50 cents. 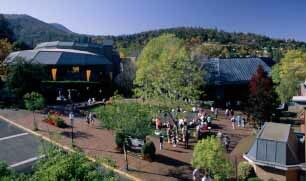 In 1937, the Oregon Shakespeare Festival Association was formed as an independent, non-profit entity. In 1953, the festival hired its first full-time, paid employee. In 1958, the old stagehouse was torn and the new Elizabethan stage opened in 1959. The 600-seat Angus Bowmer Theater opened in 1970. The New Theatre which is the youngest theatre carries on the poineering spirit of its predecessor, the Black Swan. On this intimate and extremely versatile stage, they present new works and explore plays they thought they knew in ways designed to challenge and excite the public. In 1994, the Portland branch became independent as the Portland Center Stage.